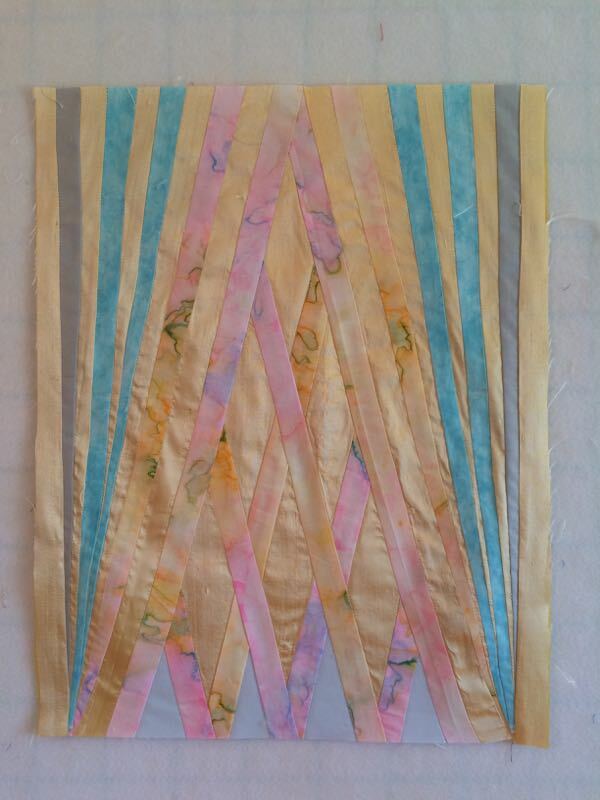 Good Friday: Four-in-Art Challenge • May 2016 | OccasionalPiece--Quilt! 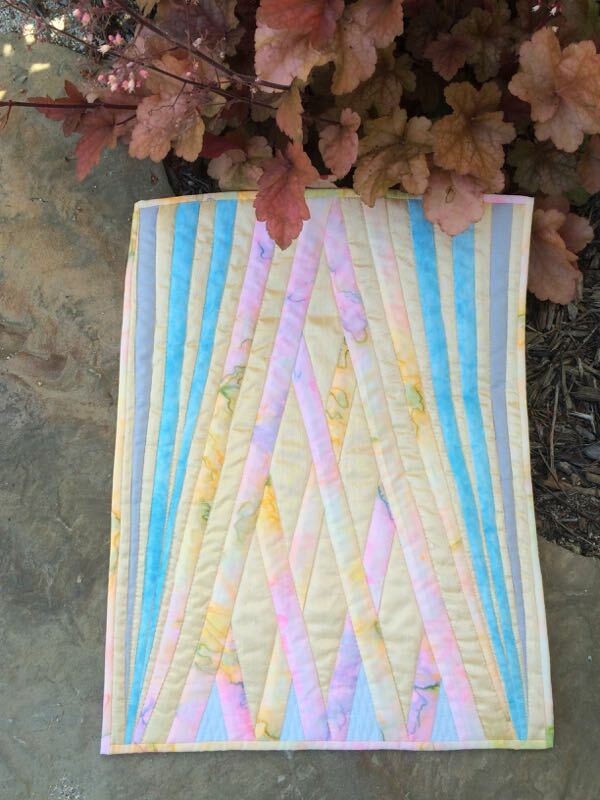 Posted on May 1, 2016 by Elizabeth E.
This quilt was inspired by time spent in Antonio Gaudi’s magnificent creation of La Sagrada Familia, a basilica in Barcelona, Spain. We visited there in March of 2016, on Good Friday of their Santa Semana (Holy Week). It was a fitting capstone to our visit to Spain, and to other of Gaudi’s architectural buildings, and from the moment we walked in, we were overwhelmed. Gaudi based a lot of his structures on natural elements, curves inherent in draped forms, local mountains, rock and nature. So I took my cue from the same, as well as trying to weave in a representation of my experience there with color, music and the Spirit. In most of the Catholic churches we visited on our trip, the center crucifix of Christ was based on what we perceived as physical pain: the suffering that Jesus as a mortal man endured on the cross for all those many hours of the crucifixion, his head bowed, the expression on his face, agony. 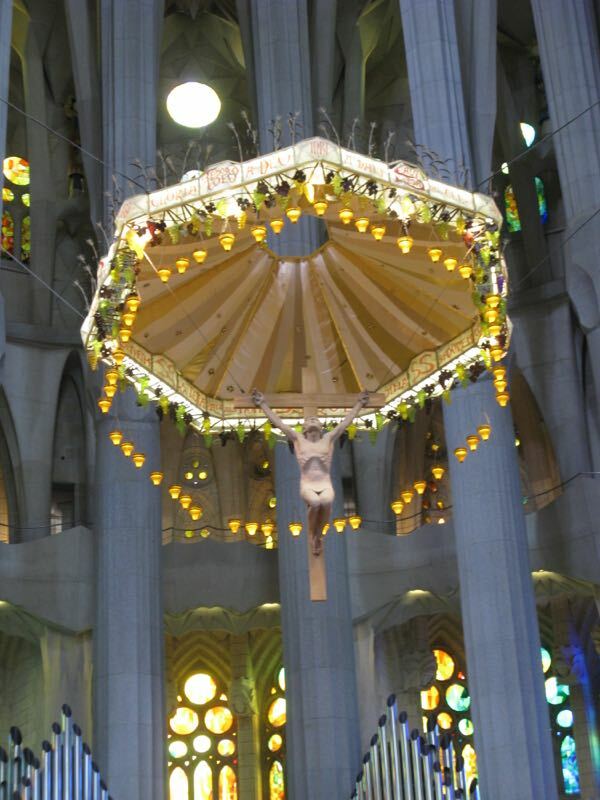 Yet in Gaudi’s church, Christ was under a canopy that appeared almost like upside-down blossom of a trumpet flower, surrounded by a vine laden with clusters of grapes, the expression on his face transcendent, his eyes focused upward. And high above him, nearly 200 feet in the air, is a golden arrow or tree that points to a further high point, a representation of his ascension to heaven. The symbolism is rich and layered for those who are familiar with the story of Good Friday. I sat down in the chairs in the nave to think and to let myself fall into what I was seeing, and surprisingly, hearing. As I sat there I became aware of music, just below the level of hum of the crowd. It was hard to decide what the score was, whether it was some oratorio like the Messiah, or a choral rendition, such as Ave Maria (which was later played at noon). The beauty of the stained glass, the unique and thoughtful Christ in the unusual baldacchin, the representation of the Resurrection by this golden motif pointing upward and the music were a fitting celebration of the events of Good Friday. On a more practical level, during our entire trip I had been puzzling what I would make for our May Four-in-Art art quilt, with its dual themes of color and music; I knew that day that I wanted to attempt to recreate some portion of what I had experienced, however puny my attempt might be. This is my third try at this structure. 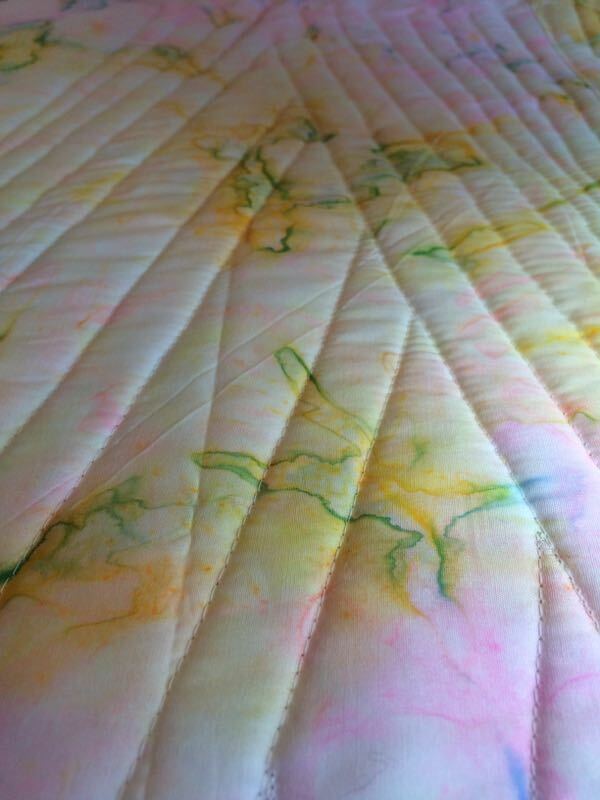 I had started out with the swirly pink, yellow and blue batik, but first used a yellow solid. Then when we went to visit my son in San Diego, I found a fabric store that sold silk shantung, and a bit of the glistening crisp fabric came home with me. I worked those diamonds multiple ways, but finally had to settle for a tepid reference to the intricacies of Gaudi’s design. I’m not too happy with the blue pieces, wishing I had instead something more grayed to bridge the swirling pastel batik to the outer gray, but again, I was aiming for a representation of the experience. 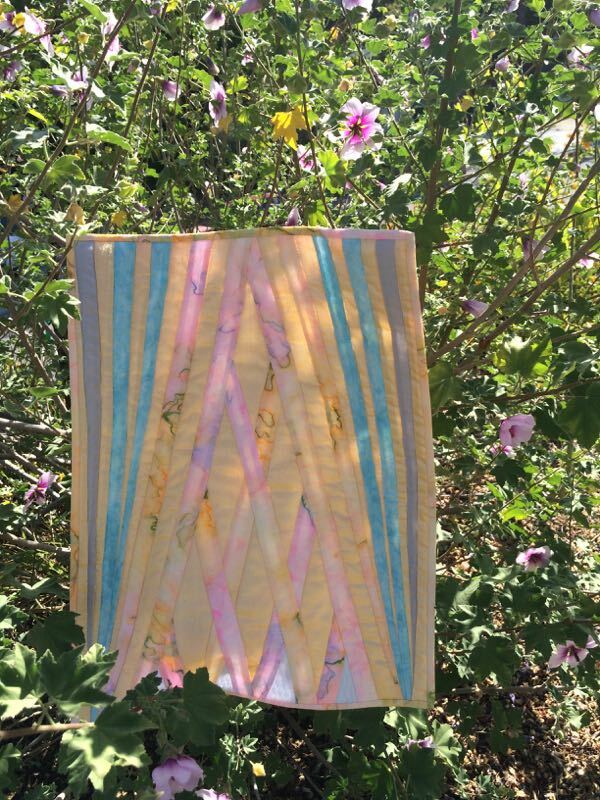 Because of the lattice shape, the dimensions of this quilt are quite different than the usual 12 inch square quilts I’ve been making in this series. 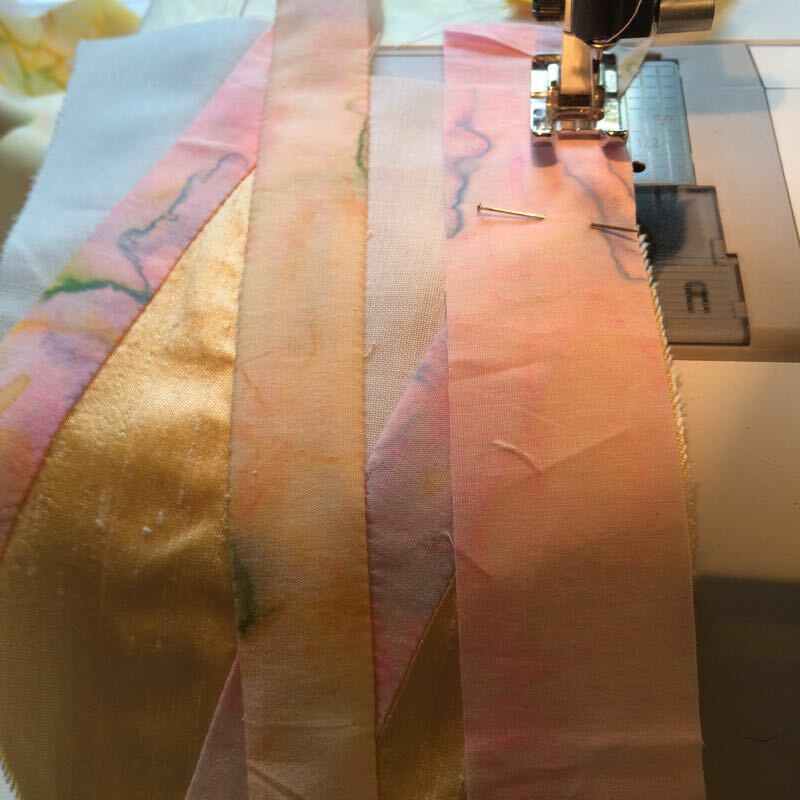 I backed it with more of the batik, quilted it up on my new quilting machine, and bound it in more batik, wishing to let the edges flow, not constrain, the design. Perhaps to someone who wasn’t there, it may seem puny or very far from that design motif high above the nave. I agree. 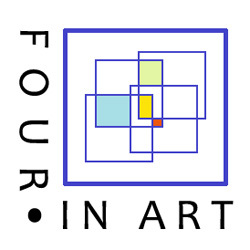 Please also visit our blog: Four-in-Art Quilts. 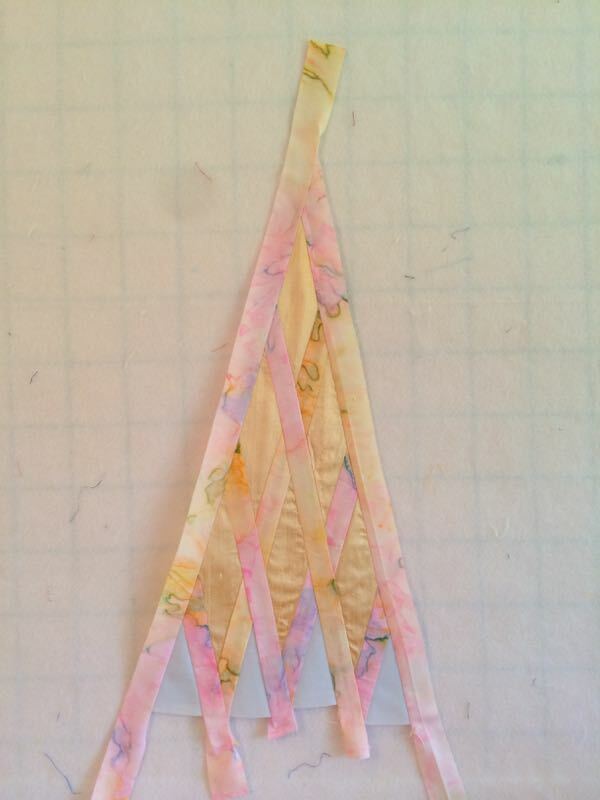 See you tomorrow for STEP FOUR of the Oh Christmas Tree QAL. 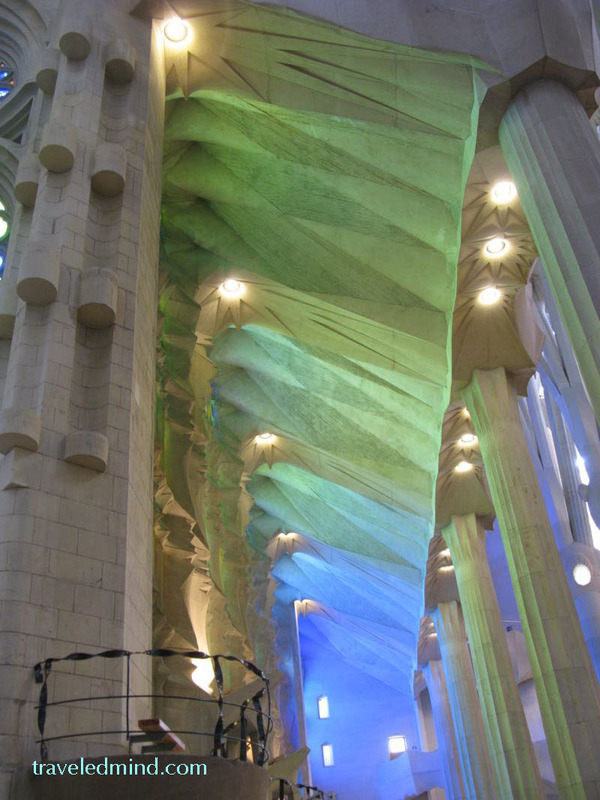 I think that you’ve captured the feeling of your personal experience, the symbolism of the ascension and resurrection and the wonder of Gaudi’s illuminated architecture in a lovely way – with your choice of colours and fabrics it looks radiant and full of optimism! I think you did a great job capturing the beauty. 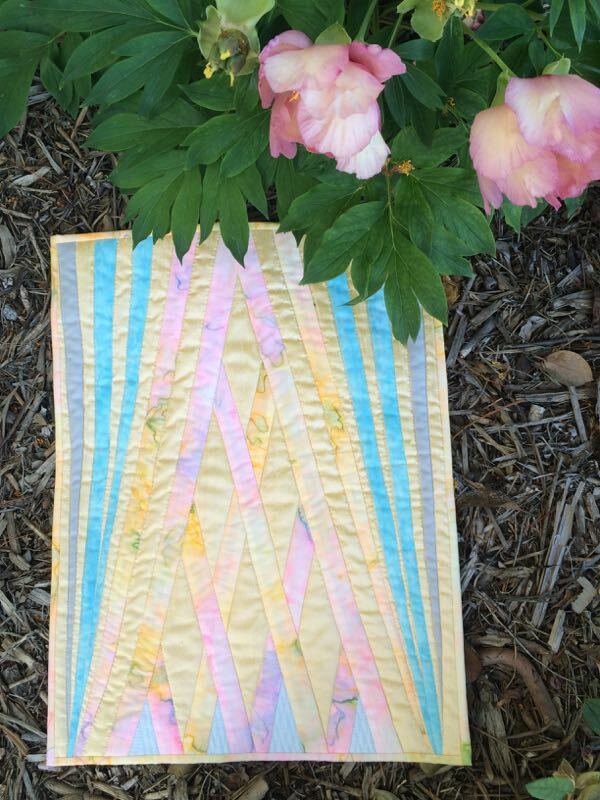 The shantung is perfect for the light reflections and you did amazing piecing to capture the lines. I can’t imagine what it would be like to have visited there on Good Friday…..what an incredible experience! 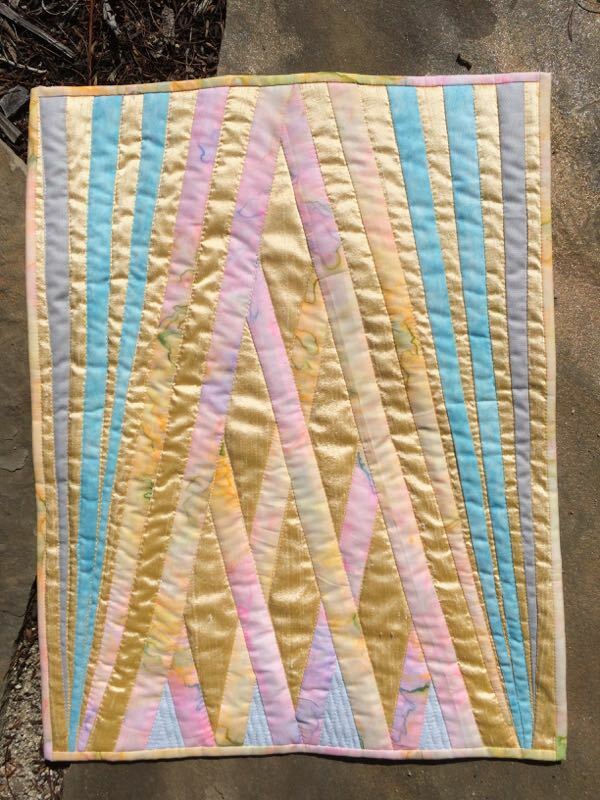 When I saw your Good Friday quilt, my very first instant thought was…’ That looks like Thorncrown Church in Arkansas’. Google it and you will see what I mean. I’ve been there and it is a magnificent place. As is Familia Sagrada in Barcelona. 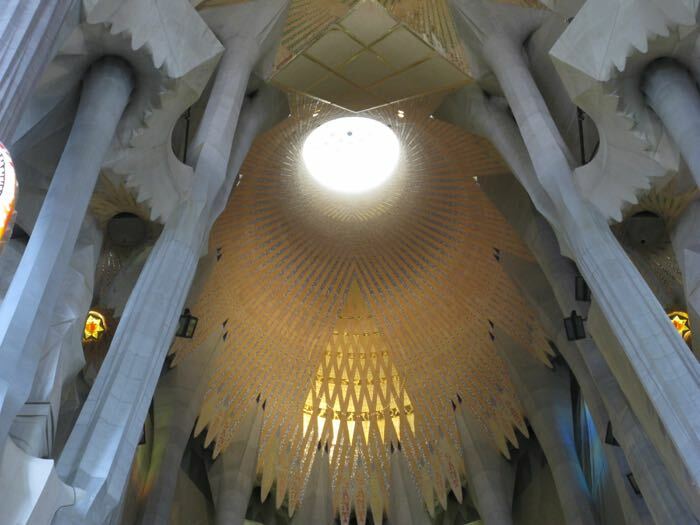 Do you ever think that Gaudi had an art teacher at some point who told him, “You can’t do that….draw within the lines!” I LOVE his work. When I was in Barcelona last, I took a Gaudi tour and saw all of his architecture with a guide on a small bus. My son goes to Barcelona every summer for a music festival. I’ll go with him one year and revisit Gaudi’s works. In Rome, in Piazza del Popolo, there is a church (with 2 Caravaggio’s) that has a crucifix in front of the pulpit with Christ bursting off the cross. One of my favorite works of art. Triumphant! 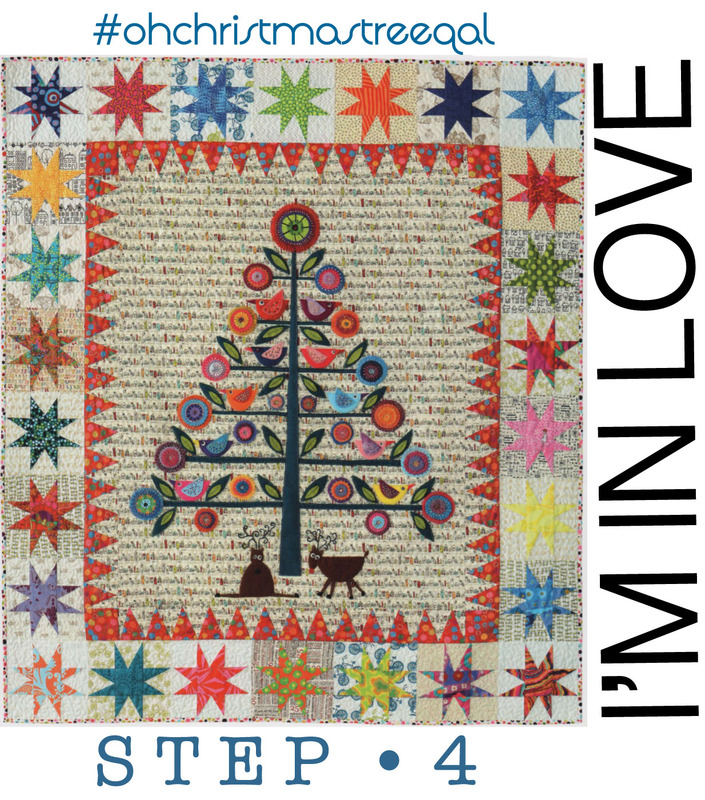 I’m dog sitting all week coming up, so will get back to the labor intensive blocks for Evan’s Christmas Quilt. I’m cutting 5 inch squares from the black and white fabric to make a checkerboard backing. I have gotten rather OCD on buying different black and white fabrics and will end up with way too much if I don’t use it for the backing too. Sort of like the cat fabric I’ve collected for the potholders for the Rome Cat Shelter. I have 66 made of the 100 I want to make this year. I have enough for another 100 for next year. Glad we didn’t go to Athens…there was hail and lots of flooding in the area. Crazy weather. This is just beautiful! I loved all your photos of the cathedral too. Beautiful! ! Love reading about about the process, seeing & understanding the result. Beautiful! And as others have said, captures the spirit and feeling you describe of your experience. I appreciate both the piece and the history of its making. 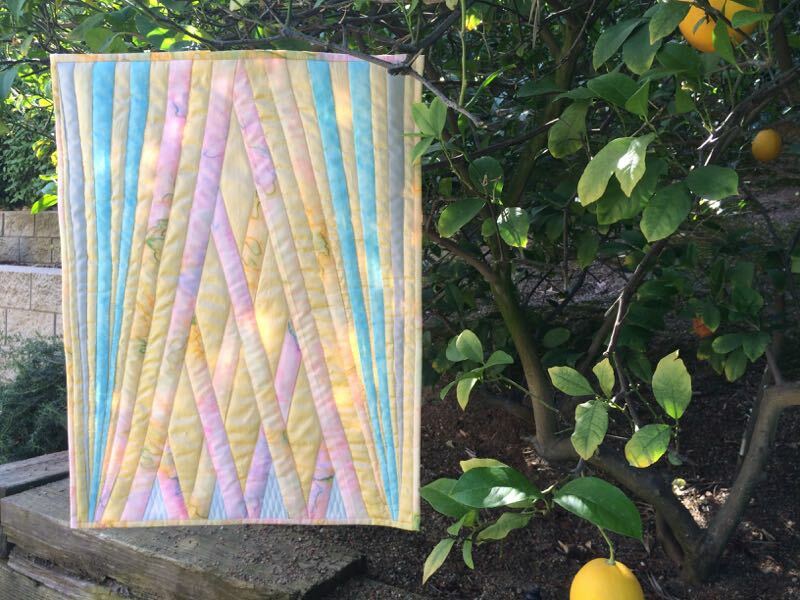 This quilt is truly creative and beautiful. 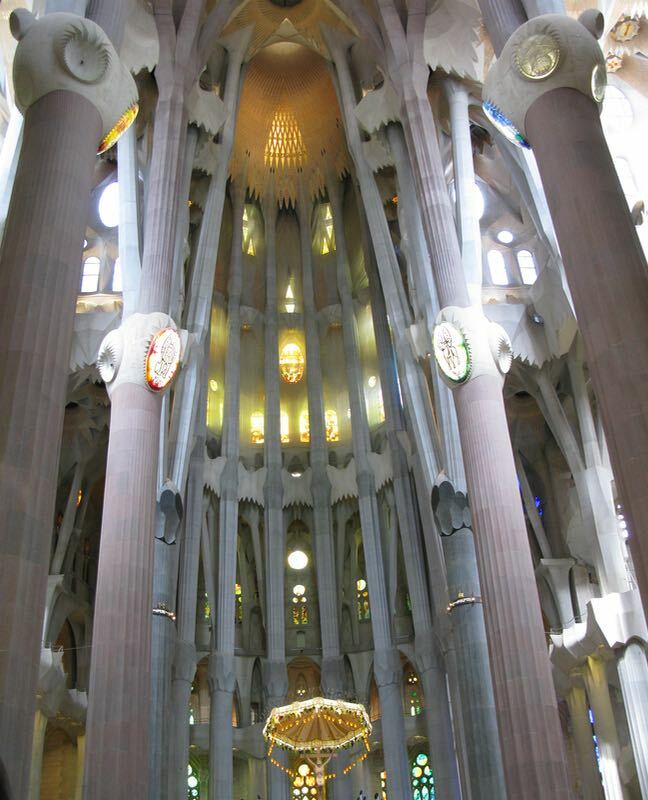 Congratulations on coming up with a way to interpret your visit to Gaudi’s basilica. Beautiful is the word I will use to describe the success of your piece. From my vantage I believe it captures your experience. I am sure actually being there was overwhelmingly spectacular and maybe not able to be recreated in such splendor. 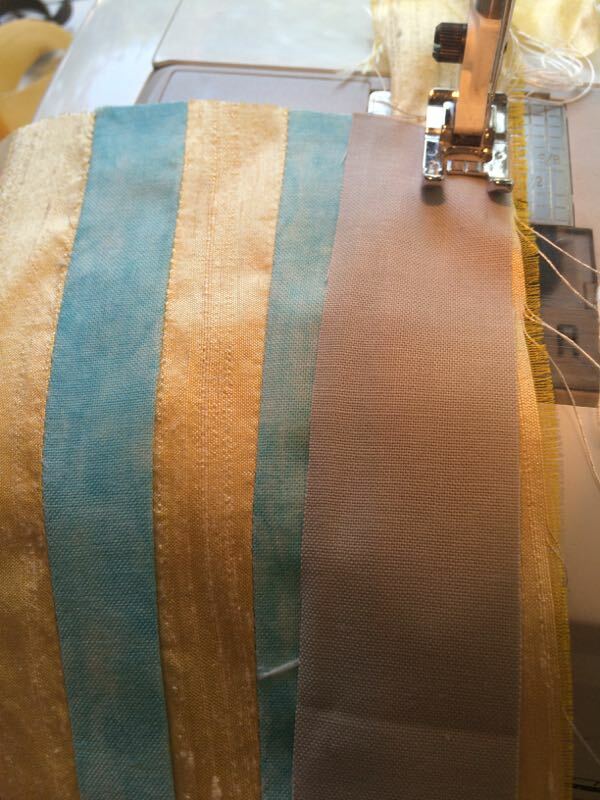 My eye followed each line of fabric you sewed and the final glimmering photo made me pause for more than a moment. Well done. Beautiful, Elizabeth. I can only imagine the experience of being in the basilica and trying to interpret that into a piece of art. The silk adds a definite richness to the piece, even in the photography the light is caught. I think it is a lovely rendition and hopefully a wonderful reminder to you of a special trip. I like the color choices–the rosy pinks and yellows, sky blue, and granite gray set atop the glorious gold. What a beautiful interpretation of Sargada Elizabeth! You certainly captured the subtle nature of the colours and the subtlety of the experience- wonderful! 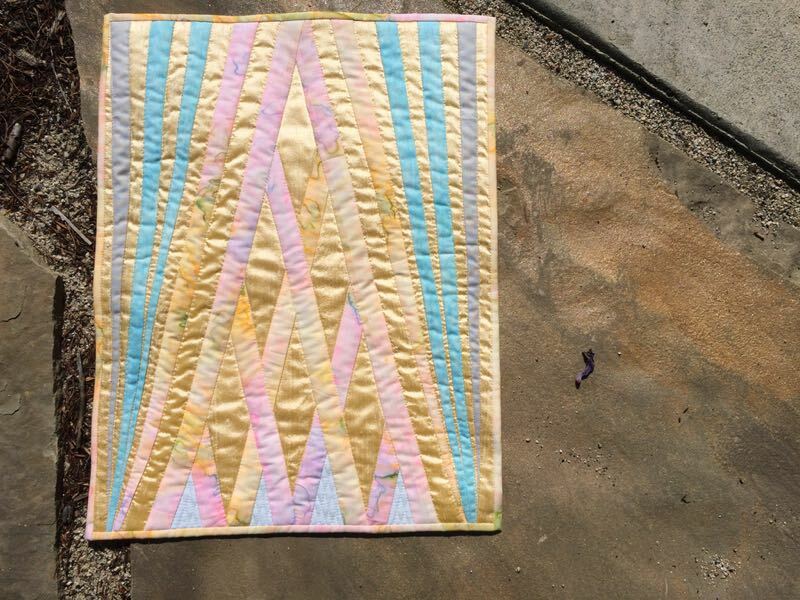 I can only share my reaction to this quilt. The minute I saw it I felt something uplifting, something calming, something that slowed my breathing. And that feeling only increased as I saw more photos. The final one glistening in the sunlight truly capped this experience. Thank you. 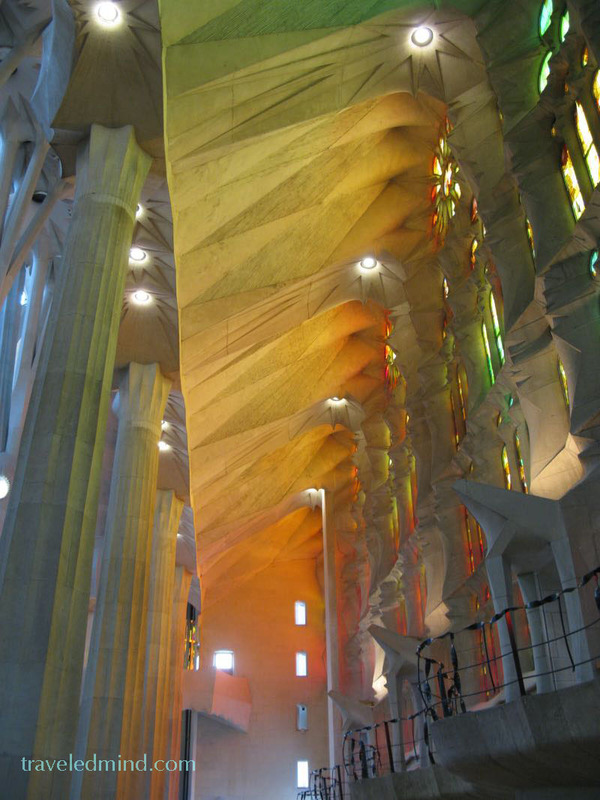 I can recognise the Sagrada Familia loftiness in your work, the glowing colours and gleam of it all! Elizabeth, when I saw your “peak” last week, I hoped you were going to capture that wonderful experience in the basilica. You did, and more. 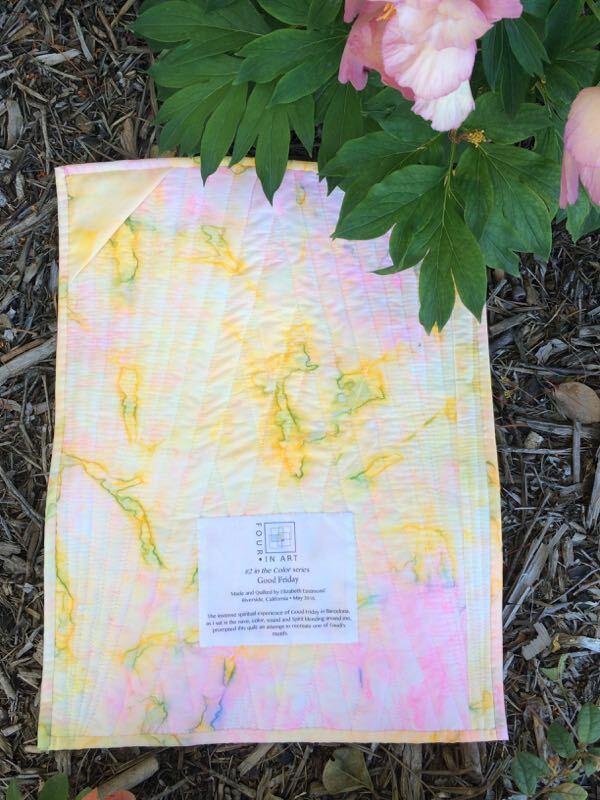 Your work of art is as calming and uplifting as your pictures, and the gold silk makes it sing. 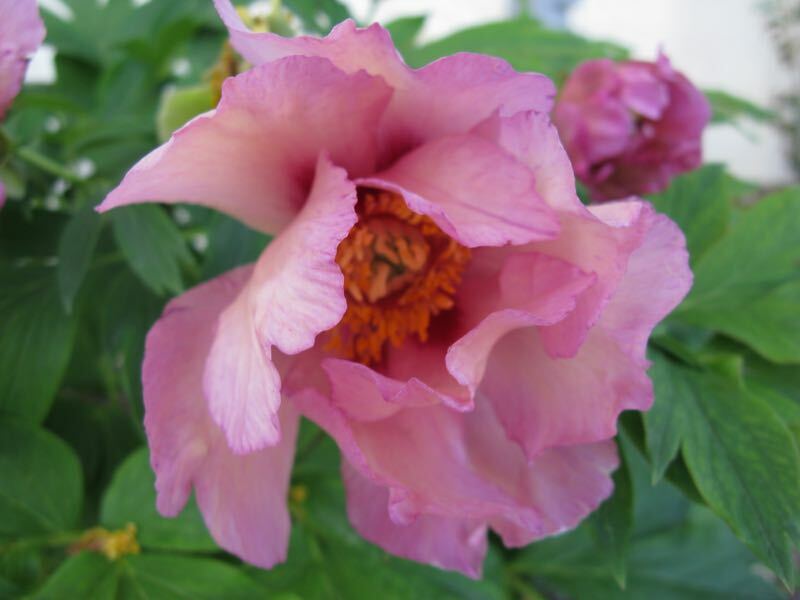 The setting of your pictures is perfect – where else to photograph but in God’s great outdoors! I really like the way you’ve used the weaving motif to ‘weave’ in your experience and also to draw the eye upwards echoing the sense of looking upwards in the basilica. I also love your combination of the silk and batiks. I think your piece captures the spirit of both the architecture and the natural world beautifully. Beautiful! Beautiful! I know I am viewing this late, please forgive me. This is the epitome of great artistry in fabric! Exquisite! Thank you for sharing. It’s always most fascinating to read your process. Lovely pictures. I think you captured the essence in a beautiful way. A beautiful interpretation of your experience. I can only imagine how amazing it must have been. Lucky you.